Andy Lau’s (劉德華) 6-year-old daughter, Hanna Lau (劉向蕙), has graduated from kindergarten! 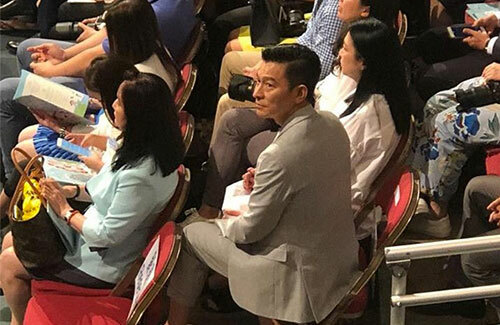 On June 6, Andy and his wife Carol Chu (朱麗倩) made a low-profile together to attend their daughter’s graduation ceremony. Families around the couple immediately noticed the superstar and started snapping photos. Andy and Carol were in a wonderful mood. Their appearance was made known following a social media update by a parent who attended the graduation event. The parent said the auditorium erupted when Andy and Carol walked in toward the end of the ceremony, around the time when the headmaster was delivering a speech. The couple tried to stay a low profile, but other families couldn’t help but snap pictures of the superstar. Andy did not wave back, but did acknowledge the families around him and smiled. When it was time for his daughter to receive her diploma, Andy stood up and clapped. Carol, meanwhile, sat still and took many photos of Hanna. When Hanna went on stage again to perform with her classmates, Andy watched intently with a big smile on his face.